A childhood evil thought long dead reawakens. In the deep, dark woods death methodically stalks its prey. A strange mirror found in an unknown cave is much more than it appears to be. The perfect plan takes an unexpected turn, while death comes for everyone in frighteningly different shapes and forms. A tortured survivor quests endlessly for atonement that may never come. Strange and terrifying creatures that shouldn’t exist, do. These are some of the chilling and speculative themes found in Brian J. Jarrett’s Walking At Night: A Collection of Horror. A work some fifteen years in the making, this collection features some of the author’s darkest themes and some of his strangest worlds yet imagined. Walking At Night will take readers on nine suspense-filled trips to the dark side of humanity, and to places beyond the realm of science and reason. A man struggles to contain a horror from his childhood he thought he’d left behind. A serial killer’s penance is delivered by a monster from his past. It shouldn’t be alive, but it is. It’s trapped in a shed…and it wants out. 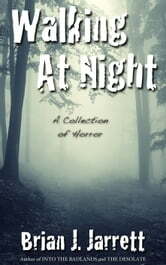 A young man trapped along a country road in the darkest of nights encounters his worst nightmare. The dark woods behind a young woman’s house hold a horror far worse than she could ever imagine. A dying old man recounts his tale of meeting death…and living to tell. The perfect murder takes an unexpected turn. Four teenage boys stumble upon what appears to be a strange mirror inside a boarded-up cave. What they discover is not a mirror at all, and what’s behind it might kill them all. Cursed with horrific visions of murder, a man tirelessly searches for his missing sister and the atonement he so desperately needs.